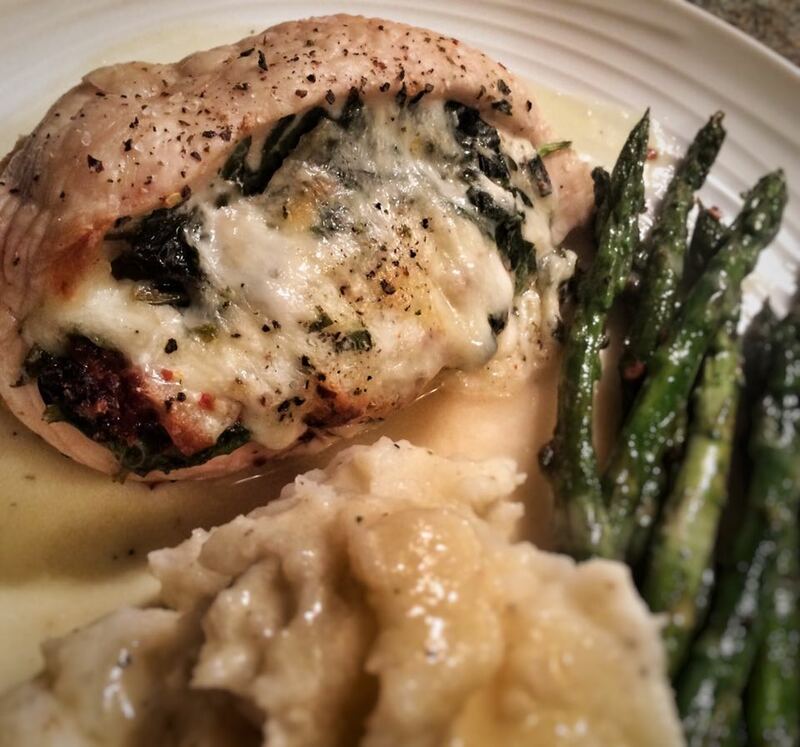 Chicken breasts are always a great thing to keep in the freezer. They are so versatile, there are a million things to do with them but one of my favourites is to stuff them with whatever is in my fridge. This recipe is a great one as the ingredients are things I almost always have in. The flavours in the chicken are delicious and the light, creamy sauce really add a luxury feeling to the dish. I serve this with asparagus and 3sp of either mashed potato or oven roast potatoes for a total of 13pp. Pre heat the oven to 180c. Line a baking tray with tin foil. Take each chicken breast and using a sharp knife, cut a slash into the side of each breast (wiggle the knife to make enough space to pack in the stuffing). Stuff the chicken breast first by lining the spinach along the bottom of the cut. Top with the tomatoes and then the mozzarella, pushing the cheese right in. Pop the basil on top of the mozzarella. Season the chicken with salt and pepper and then pop in the oven for 25-30 mins (until cooked through, it will depend on the thickness of your chicken breast). Whilst the chicken is cooking you can prepare the sauce. Spray a small sauce pan with low calorie cooking spray, heat the pan add the onions and season. Fry for 5-6 minutes until they start to soften and then add the garlic. Fry for another minute or two and then add the wine, stock and bay leaf. Simmer until reduced by half and then add the cream (or crème fraiche) and mustard. Season to your liking, turn the heat down and simmer until the sauce thickens a little. At this point you can either sieve the sauce to make completely smooth or leave and keep warm and have it chunky. Pop the chicken onto a plate with whichever accompaniments you have gone for (I did mash and asparagus this time) and top with the sauce.